Every marriage is different and couples go through cycles throughout the course of their marriage. Transitions occur from the newlywed stage (new love) to shared love to settling in (mature love) to renewed love. During the course of marriage, couples may experience romance, disillusionment, disappointment, misery, extreme hardship, reawakening and everything in between. Marriages don’t run exclusively on love. The newly married think they can sustain their marriage on love alone, but after a while, they begin to notice that marriage takes work. Sometimes hard work! Let’s face it. Sometimes our marriage needs a boost every now and then. Just as a car needs a regular oil change, we need to tend to our marriage. Other times, we need four new tires, an alignment or a jump-start when our battery dies. In order to keep our relationship alive and healthy, we need to provide periodic tune-ups. I’ve designed a 21-day program (Reenergize Your Marriage in 21 Days) to give you simple techniques so that you can add a little more life into your marriage. Putting into practice new techniques and learning new skills is what this program is all about. This program takes only 21 days. Each day you will be given an assignment. By the end of the 21 days, I’d like to think that you will be more content with your partner and marriage. You may feel lighter and brighter about your marriage and interested in spending more time with your spouse. This program is not a quick-fix, but can serve as a “boost.” My assumption is that you, like almost everyone else, would like to see improvement and that you already have a certain degree of contentment in your marriage. This program gets right to the heart of the matter and gives you tools that will boost your marriage. I structured the exercises in a certain order to awaken and strengthen endearing feelings for your spouse. One day you might write a note; another day you might simply observe your spouse; the next day you might be asked to have a conversation about a personal topic – so I mix easy exercises with things that might ask you to leave your comfort zone. I think you’ll like the variety of ways I ask you to create a more joy-filled relationship. Follow this simple, doable program and you will find yourself thinking about, feeling more fondly toward, and listening more intently to your spouse. You will have a heightened awareness and more profound involvement in your marriage than you already do. If you want to add a little more life into your marriage, improve communication, intimacy and admiration for your partner, this is the book for you. If you want to have more fun and strengthen your friendship with your husband or wife, then download this book now (www.smashwords.com or free for newsletter subscribers until 6/15/11) and get started. You can’t afford to NOT do this program. The link to download this book as a PDF file for free expires on 6/15/11 and was sent in a special mailing to the newsletter email list and I encourage you to save a copy on your hard drive since after 6/15/11 the link in that email will no longer be active. If you did not receive that email, have some problem accessing the file or saving it to your hard drive please send me an email at lynn@marriagecoachlynn.com and I will be glad to assist. Who wouldn’t want to be given the techniques to adopt some simple habits that promise to improve your marriage? Who wouldn’t want to put forth a little effort for a big payoff? The secret to a happy, fulfilling marriage is to become an active participant in your marriage, to treat your marriage as a priority and to continuously nurture and renew your relationship. Reenergize Your Marriage in 21 Days is guaranteed to help make your marriage great if you do your part. Reenergize Your Marriage in 21 Days was discussed on “Your Marriage Matters” on 5/17/11. www.blogtalkradio.com/marriagecoachlynn. The secrets of long-lasting, happy marriages include simple things that increase warmth in a relationship. Try this: As early as possible in the day, spend one minute hugging your partner. My friend Kristine James has been doing this for many years and highly recommends it. This is your opportunity to stop the world for just a minute while you embrace, taking in the feel of your partner. What a great way to start the day. One minute can seem long and if it is awkward, aim for 30 seconds at first. You can hug horizontally in bed upon waking, but try to develop a habit of hugging after you’ve gotten ready for the day, before going your separate ways. After you’ve showered and gotten ready for the day, your paths might cross in the hall. What a perfect time for a smile and a hug. This is a hug from the heart. If you start every day this way and make it a habit, you will add warmth to your marriage and improve your physical, emotional and mental health. By making a hug a ritual, you will be less likely to carry resentment and anger into the next day. How can you be upset with your partner if you know you will be hugging each other for a minute each day? If you adopt this habit and find that you neglect or miss several days in a row, you will notice that things are not “right.” As soon as you notice a little distance, talk about it. Consider a hug a day an insurance policy. You will insure against the possibility of drifting apart. 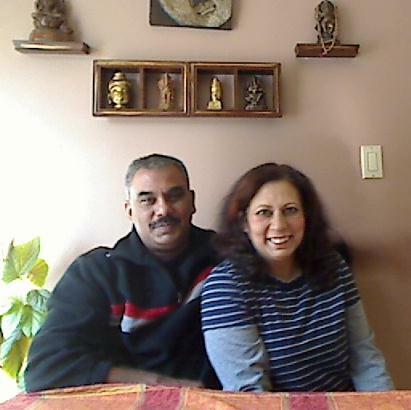 Meet Rajeev and Charu Chauhan. Married since 1991, they place a high priority on daily walks. They walk for at least an hour a day, except for extreme weather conditions. “Walking is a passion,” says Charu. “Even when we are tired, we go for a walk in the neighborhood. It’s relaxing and is part of our routine.” During these walks, Rajeev and Charu have the chance to talk about all kinds of topics that come to mind and believe this is a vital part of their marriage.